Another piece to Michael Jordan’s achievement puzzle, is the Last Shot in 1998 where Jordan pulled up for a jumper over Bryon Russell to win the 1998 NBA Championship. At the time, Michael Jordan wore the Air Jordan 14 (XIV) Original Black / Red aka Last Shot. 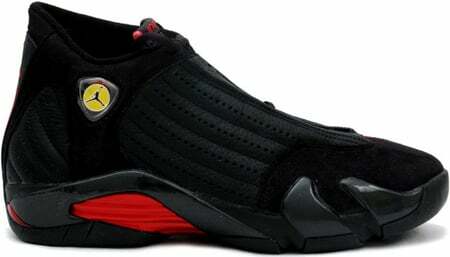 The Air Jordan Original 14 (XIV) Last Shot featured a Black / Black – Varsity Red colorway. Although Michael Jordan wore the Air Jordan 14 (XIV) OG Last Shot very early, the public release launched March 27th 1999 with a retail price of $150.